Nosso 1 Quarto, 1 Banho Cabine de Luxo oferece uma bela vista sobre Bear Mountain. Pores do sol agradáveis ​​fora da varanda cobertos também. Fique em casa e ler um livro em frente à lareira, relaxar na banheira de hidromassagem ou jogar um jogo emocionante de bilhar na sala de jogos. Intimate suficiente para uma lua de mel ainda capaz de acomodar até 4 pessoas. Desfrute da brisa relaxante tranquila da nossa varanda no belo cenário Smoky Mountains. Deixe o nosso transporte cabine você da agitação diária e agitação para um lugar onde você pode refrescar e renovar, e depois ter tempo para desfrutar das Great Smoky Mountains National Park, antiquários shoppings, feiras de artesanato ou fazer compras em Wears Valley, Pigeon Forge, ou Gatlinburg. Nós esperamos que você aproveite a sua estadia em nossa cabine, tanto quanto nós. Ficou 6-21-18 Connor F escreve: Nossa estadia no Nature's Romance foi tudo o que pedimos e muito mais. Nós tivemos um tempo maravilhoso nesta cabine bonita. Jill foi muito útil para responder a todas as nossas perguntas antes, durante e após a nossa visita. Ela também nos deu ótimas recomendações de coisas para fazer em ambos Pigeon Forge e Gatlinburg. Recomendamos altamente reservar uma estadia nesta cabana. Ele foi perfeitamente isolado e o ofurô no deck foi um ótimo toque. O muito confortável cama king size também foi great após um longo dia de caminhada pela cidade. Obrigado novamente a Jill e sua família para uma excelente hospitalidade e umas férias relaxantes. Obrigado por nos deixar ficar em sua bela cabine! Nós nos divertimos muito e não podemos esperar para voltar para visitar! The cabin was rather dirty there was a lot of dust that could have been cleaned the couch and bed was very uncomfortable if it weren't for the topper on the bed you could sleep on the floor and get the same results.pulled down the covers and had cockroaches on two pillows.almost right then.then the next day found two more.just have to look before you leap. We take exception to this review. The cabin has been treated (sprayed) monthly since we built it. So we believe that is untrue and wonder why Vinny wouldn't have called us immediately so that we could address if he had any issues. We already know how clean it is. My husband and I stayed there and got back today. We had no issues as Vinny states! The bed is completely new this year. People prior to Vinny (the day he checked in) loved the cabin and quote "cabin was beautiful, clean, comfortable and private" We get many guests that return a few times a year since they love our cabin. The people that stayed after him (the day he left) wrote: This is from Nicole form Nashville: "We loved our time away here! The space is so beautiful inside and out. It was so clean. We loved how secluded the cabin was and how cozy it felt on a cold night! We enjoyed the hot tub, cooking in, and sleeping in the soft king sized bed. Jill was extremely helpful and quick to respond with any questions. We can’t wait to return for a long stay next time!" Some people just are never happy and you cannot satisfy them and we don't believe what he has written...totally surprised we didn't hear directly from him. We take care of everything for guests immediately. Good selection of dishes and cooking ware, very clean, excellently secluded as advertised. Bed sagged slightly in the middle, but was comfortable enough to sleep in. Really awesome jacuzzi! Management was very helpful and engaging. Great customer service. Thank you for staying with us and for your 5 star review. Totally surprised about what you said on the mattress... as it it completely new! We have had so many compliments on the memory foam comfort. Everyone loves it! Glad you enjoyed our beautiful cabin and the area. We love our guests and we love both our cabins! Thank you. All we can say is wow! So much more than expected! Away from the hustle and bustle but close enough to enjoy everything around! We will definitely stay here again! Jill was great to work with and answered any and all questions we had! Robert and his wife were great guests. They treated our cabin lovingly. We enjoyed hosting them and hope to host them again in the near future. We recommend them highly. I do not give this 5 stars!! My husband chose this pet friendly cabin based on a 5 star review and it being secluded on 1 acre. Neither of us would give this 5 stars. Although it was very secluded there wasn't much out door space. Our plan was to stay 4 nights but we left after 2 nights. Due to the wet pavement and my husband hand to put our truck in four wheel drive to make it up the very steep driveway, I suggest having a four wheel vehicle if you stay here. Upon arrival we found the front door unlocked however, nothing seemed to be out of place. At first sight it seemed to be a nice cabin with enough space. The hot tub cover stunk of mildew, the tub had a brown ring around the inside, once started brown bubbles were forming in the corner of the tub. In the morning we notice that the sides and bottom of the tub were filthy dirty. The owner thought that house keeping didn't clean it. The floors didn't seem to be cleaned thoroughly, we saw dust bunnies throughout the cabin. When I mentioned this to the owner she stated that maybe house cleaning didn't clean at all. The bed was very uncomfortable, we didn't get a good night sleep. It took 45 minutes to brew 9 cups of coffee. The shower head didn't have full pressure, we were told by the owner that was due to the well water and that it needed to be cleaned out with vinegar. Needless, to say we were very disappointed!!! However, if these things were taken care of it would be a nice cabin. Our property is VERY typical of the Smoky Mountain area.Of course it is Mountainous terrain. I don't have 4-wheel drive and get there in all kinds of weather. Maybe they were expecting flat land like where they are from. We have a grill & picnic table & area to sit out. We don’t advertise that. It’s just a nice bonus! We Do have over an acre of beautiful, wooded property. Very, very private. Some of the things said were just untrue. Coffee maker tested and brewed normally in a few minutes. Had they called me, I would have told them where I keep back-up coffee maker and other items. Why suffer? I know I need my coffee! It all perplexes me why no call. I asked her why she didn’t call me immediately as I would have sent someone up, AND rectified the situation immediately! Her response was, and I quote, "I didn’t feel I had to” THEY chose to check out 2 days early. The hot tub was crystal clear upon inspection. Housekeeping took care of the shower head in minutes and is perfect..that was something that could have been taken care of immediately. She told me the water pressure was great.That was in conflict to what she put in her review. She also exaggerated my words. I only asked her if she thought it was cleaned. (I thought maybe mix-up) but no, she said it was cleaned. Guests staying before her said that they slept the best they’ve ever slept! So, I believe it’s a personal preference. I can only arrive at the fact that her complaints are an excuse to get a refund.There was some reason they had to leave. We strive to make our cabin beautiful and comfortable. We have happy guests that love our cabin. We put our heart and soul into every aspect of our cabin & LOVE what we do. The cabin was very nice and clean. I also spoke with Jill, the owner, over the phone a couple of times and she was very accommodating and made sure we had a great stay. Would definitely stay again! Thank you so much for staying with us. It was a pleasure hosting you! 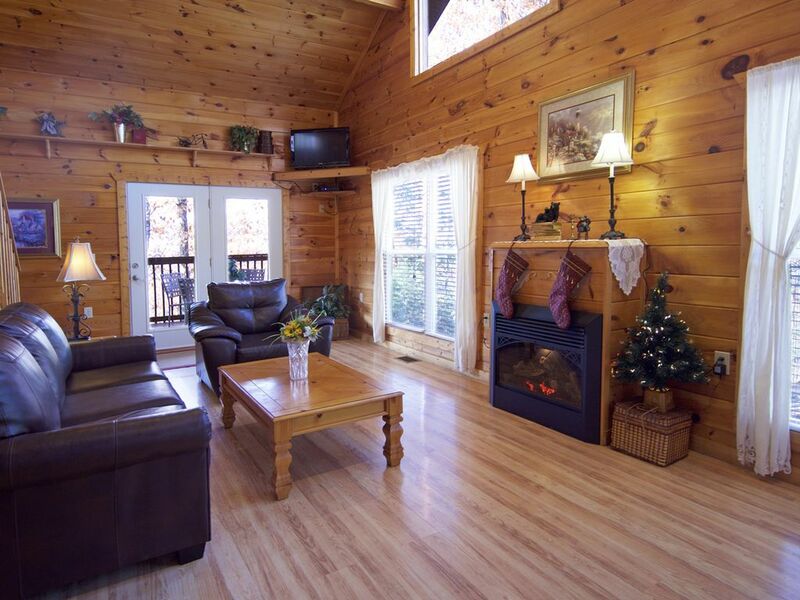 Secluded & Private cabin, perfect for a couples retreat! We booked this cabin for our anniversary. This cabin is exactly as pictured. It was very clean & smelled fresh. The owner, Jill, was very easy to communicate with. If you are looking for a private getaway, this is your place. The bed was very comfortable & the kitchen has all the basic necessities. The upstairs loft was a great place to hang out & play pool. The view from Bear Mountain is breathtaking. Bear Mountain also has trails that you can explore & hike. We will most definitely rent this cabin again! Thank you for your lovely words Marilyn. We surely hope you'll come back again soon so we get the pleasure of hosting you again!